The main goal of this website is to provide visitors with a number of natural options that may help reduce symptoms. I’ve been looking into every form of natural treatment for years and have definitely found that many do change the course of the condition. There’s really not many other options, since there isn’t a cure. I couldn’t stand being on so much medication, especially at such a young age. Through research, I’ve read about what chemicals are missing or aren’t being adequately produced, in the brains of people with Fibro. I’ve tried to supplement these chemicals, naturally. I’m huge on “funny”. When I was first diagnosed, I would watch episodes of Friends over and over again because I would notice that I simply felt better while doing so. I wasn’t sure why, but if it worked, I was gonna take it. No doubt it had to do with chemicals that I was otherwise lacking in, being supplemented by the laughter. Crazy how something so simple can literally make you feel better and promote the release important chemicals that aid in that very process. A major plus in going the “natural” route, are that you can try it all and figure out what does and doesn’t help your individual needs, and you can do it without a prescription. In the beginning, I felt like I had no control over the situation and had no choice but to sort of roll over, since there was nothing I could take besides pain medication. If I wanted to feel better, medication was the only thing that would work, right? I didn’t have a reason to believe otherwise or to think outside the box, especially at 18 years old. My doctors did always encourage exercise. Exercise was the key to everything. I can’t argue with that. As hard as it is sometimes, it does produce amazing results. The fight is worth the reward. At that point, though, I felt like it was impossible and ignored those orders. It probably was impossible. I was so doped up on pain killers and other medications, that I can’t imagine not having passed out after 5 minutes of raising my heart rate. I began to believe that everything I was feeling, was from the Fibromyalgia. I constantly had moments where my heart would race so fast that the only thing I could do to stay conscious, was have someone hold my legs higher than my heart. The nausea was intense and I couldn’t eat. My mom, being a nurse, suggested that a lot of this was being caused by the medication. It wasn’t an even trade off. I’d rather be in SOME pain, than feel as horrible as I did. She was right. The intensity of those symptoms, were side effects from being on so much medication. I personally believe that it’s just not ok to be on a ton of medication. I feel like your body is telling you something when it rejects it to such a strong degree. Certain symptoms seemed to get worse as I increased medication and doses. I would even have this weird pain stretching from my shoulder, down my back and arm. It didn’t feel the same as the normal Fibro pain, and it got worse with each dose of pain meds. 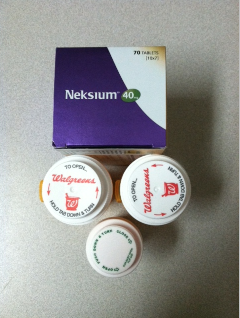 The process of getting down to the amount of meds I’m on today (Hydrocodone 5/350 – 3/4 of 1 pill once every other day, Celexa 5mg 1/day and Nexium 40mg 1/day and very rarely, a dose of Domperidone for gastroparesis), was not easy. I’m not even gonna blow smoke up your a**. I had withdrawals from *everything*, the pain was intense, I was sad. It wasn’t as bad as what I have seen on TV, with people withdrawing, though. I took it all very slow and under the supervision of my doctors (which is absolutely imperative – you shouldn’t do it yourself, as different medications require different weening methods), and that helped with the process. What kept me going with it was the hope that the feelings were just representative of my body regulating and getting back to itself. Hard work usually gives the best results, right? Except for the lottery. I supplemented the medication with natural treatments (many of which I’m recommending on the site-especially the 3 core factors I implement for well being, which are mentality, exercise and nutrition). I had been on high doses of Elavil (before switching to a high dose of Celexa), 6+ Hydrocodone 5/500 (I switched to this from Demerol), Nexium 40mg 2 times daily, Phenergan or Compazine for nausea, frequent doses of Xanax. I even tried Guaifenesin, which, for me, did nothing besides make me smell weird. Besides my mom’s encouragement to lower my intake of meds, a frequent occurrence that made me think that a lot of my symptoms were a result OF the medication, was that whenever I was in the hospital with a bout of Pancreatitis, post surgery or admitted due to a really bad flare up, I was put on a Demoral IV drip, along with Phenergan. Sometimes I’d even be given a Morphine drip. I know when I was on these medications, I felt like I had a drug addiction. They made me feel horrible, but were also keeping me from going crazy due to pain. When I would leave the hospital, the withdrawals were the worst. I couldn’t read a magazine because my eyeballs were bobbing all over the place. I decided there had to be a correlation between feeling so terrible, and the medication I was on. I couldn’t remember what it was like to be in a drug-free state of mind, and that wasn’t ok with me. If the meds could turn my brain to mush, what were they doing to my body? I felt it would be one thing if I were on medication that was keeping me alive, but I wasn’t. I was on medication that was putting a band aid over symptoms and causing even more symptoms in the process. I think I live a better life than most people with Fibro. By no means is it cured. I do have pain every day, but I’m able to push through days with zero pain medication. I take the hydrocodone once every other day, to take the edge off and give myself “a break”. 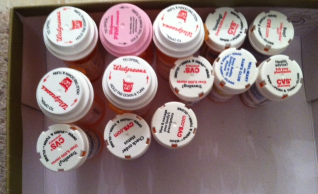 I will say my life is hundreds of times better than it was when I was bogged down by all those medications. I have to be more disciplined, but I like that. It’s not the easiest road in the world, but if you start off slow, it can be a lot easier than you may think. It may not be for everything, but for me, it was worth a shot. Since reducing my pain meds, my blood tests come back perfect and so do my vitals. My resting heart rate is that of an athlete. My ability to concentrate has improved a hundred times over and my tolerance for pain, while still abnormal, has increased greatly. I still have Fibro and I have by no means, cured it. I am, however, living in a completely different body than I was 8 or 9 years ago. I don’t feel like a “sick person”. I feel like a person who experiences pain, headaches, GERD etc… but my body doesn’t feel tattered or worn down like it had. I feel like a healthy person, with symptoms. I don’t feel bad for myself. I often wonder how much of a wuss I would have turned out to be, if I didn’t end up with this syndrome. 😉 If there is ever a way to “get rid of it” or “put it into remission”, I want to be in tip-top shape for it. Hopefully some of the suggestions help others, the way they’ve helped me. If not, my goal is to provide an outlet for the Fibro sufferer. It can be a lonely condition, and communication with others in the same boat may make a world of difference.